Dad is in the Halloween spirit all year round. 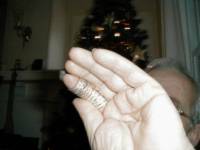 For example, here Dad uses his own hand as a festive mask in his official www.jeffthomas.com photograph, taken Christmas 2000. Welcome to the spooky jeffthomas.com Halloween Snake Pitbecause snakes are supposed to be scary, right? To play, wait for the game to load, then click your mouse pointer one time within the game area and hit your "S" key to S-s-s-s-start. Use your arrow keys to maneuver the snake around the maze, gobbling the mice to grow and to score points while trying not to run into the walls or yourself. When the red key appears, grab it to advance to the next level. If you make it through all five levels, you start back at the beginning but the game will move a little faster. In an added tribute, the snake in this game is the very same color as the paint job on Snake Thomas' most prized possession, his Volkswagen Beetle. Now that is scary! Click here to email the jeffthomas.com Halloween greeting to someone you love!